Welcome to Nationwide Mobility, Easy Access Baths & Showers, Walk-in Baths, Bath Showers & Bathing Aids at affordable prices. 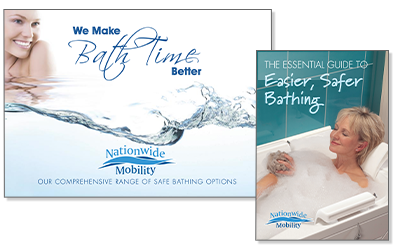 Nationwide Mobility are proud to offer one of the most comprehensive ranges of best selling Walk in Baths in the UK today. Click here to find out more about our range. Looking for a bath lift? Nationwide Mobility have a fantastic range of bath lifts that can all be tried in the comfort of your own home with no obligation. Click here to find out more about our selection. Struggling to get in and out of the bath ? Take a look at our fasntastic walk in showers or wetrooms with no or low thresholds its easy to just step in! Click here to find out more about our ranges. & guide to safer bathing today! Here's just a few comments from our customers. I am writing to express our pleasure and satisfaction at the delivery and installation of our new bath. I enjoyed a bath for the first time in 3 ½ years and I shall certainly recommend you to my friends. I recently took delivery of my Bathmate and must say how pleased I am with it. I was very impressed with your quick and efficient service and thank you for your prompt attention. I'm so pleased to tell you that my husband and I are very pleased with our Mermaid Bath Belt. It's lovely to have a nice "wallow". It's so easy to use, and is neat and tidy in the bathroom. We are delighted with the bath installed last week and with the attention given by the gentleman who installed it, they were very pleasant. I am delighted with my new Bath Lift and would recommend it to anyone. Our lines are open 24 hours a day, 7 days a week. *Time based on straight forward fitting. **Not in conjunction with any other offer. T&C’s apply. © Copyright - Nationwide Mobility | The copyright and all other intellectual property rights in the materials contained on this Website, together with the Website design, images and source code, belongs to Nationwide Mobility Ltd and all rights are reserved.